Date 09.06.2017 Vivid Sydney is a 23-day festival of light, music and ideas. Vivid Sydney features many of the world’s most important creative industry forums, a mesmerising free public exhibition of outdoor lighting sculptures and installations and a cutting-edge contemporary music program. 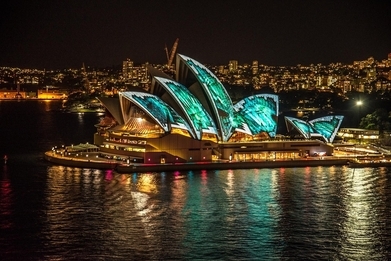 Vivid Light transforms Sydney into a wonderland of ‘light art’ sculptures, innovative light installations and grand-scale projections for all to enjoy – for free. It is a magical celebration of light-design excellence and the world’s largest outdoor ‘art-gallery’: a unique Vivid Sydney experience.